This residence is offered exclusively to City, University of London first year undergraduate students in conjunction with Liberty Living, a third party housing provider. Students who are offered accommodation at Liberty Court will sign an agreement with Liberty Living and not with City, University of London, and will therefore be bound by Liberty Living's terms and conditions. 291 furnished single rooms arranged in self-contained cluster flats. Rooms are 12-14 m2 with a mixture of single and small double beds (allocated randomly). The flats are in self-contained groups of three to five single study bedrooms, with shared lounge, kitchen and bathroom facilities. Bedroom furniture includes bed, mattress, wardrobe, desk, chair and bedside cabinet. Kitchens are 15-18 m2 and include dining table & chairs, electric ovens and 4-ring hob/extractor fan, fridge freezer and microwave, shared between two to five people. Bathrooms have shower, toilet, basin and mirror, roughly 4 m2. Approximately 10 minutes' walk from City's main buildings. City, University of London recognises that the cost of living and studying in London can be high. 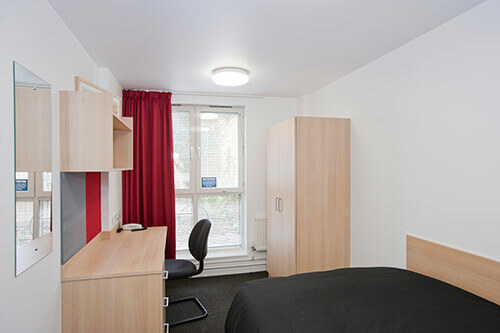 In order to make studying at City affordable and accessible to all our undergraduate students, City has introduced an accommodation subsidy to reduce the cost of its undergraduate halls of residence. Liberty Court London is located in the historical Smithfield district, which still maintains a centuries-old covered market with a gorgeous Victorian facade. The neighbourhoods of Clerkenwell and Barbican, both centres of art and musical activities renowned throughout the City of London, also border Liberty Court, ensuring students enjoy an enriching City life. You won't need to travel far for food, drink or other necessities. As a central accommodation provider in London, Liberty Court lies close to grocery stores, post offices, stationery shops and more. What are the rent instalment dates and amounts? If you do not have a UK guarantor you will be required to pay for your accommodation rent in full on the 01st September 2018. Total contract value £6,084.00. Rent is paid in one instalment or four instalments. The option to pay in 4 instalments is only available to students with a UK-based guarantor. You can only pay in instalments if you have a UK based guarantor. Yes, you do - all students wishing to pay in instalments must have a UK based guarantor. What if I don’t have an UK guarantor? If you do not have a UK guarantor you will be required to pay for your accommodation rent in full on the 1st of September 2018. Total contract value £6,084.00. What do I pay to reserve my room? You will need to pay Liberty Court a £200 deposit to reserve your room. The deposit will be returned to you when your contract ends in full, providing there is no outstanding rent, outstanding charges or damages. You may pay by direct debit, bank transfer, debit/credit card or cheque The payments are made to Liberty Court and not to City, University of London. Yes you can. For bank details, please contact Liberty Court after you have received your contract. If you intend to pay your accommodation through your student loan, please note you will need to make a payment of £250.00 on the 1st September 2018 towards your rent with proof of your student finance. Please note we require your Maintenance Loan Schedule stating your personal details and your payment dates as proof of your student finance. Your Acceptance Letter from Student Finance will not be accepted as proof of entitlement. Once your Maintenance Loan Schedule has been submitted to Liberty Court Accommodation Team they will issue you with a Payment Plan form that will need to be signed by yourself and your guarantor. Once your signed Payment Plan form is returned to Liberty Court, they will amend your payment dates accordingly. There are no discounts for paying in full. Can I cancel my contract after I have moved into the room? If you book your room, and advise us after the 15th August 2018 that you want to cancel the room, you are liable for the rent until a replacement student is found to take over the room. If you find a replacement student, you are able to transfer the contract and will not be liable for the accommodation fees. Liberty Courtl does however have the right to keep £100 as a cancellation charge. You would need to contact the Accommodation Team for further advice and to complete an Early Leaver's Form. For this Hall, the replacement Tenant must be a first year undergraduate on a full time course at City, University of London. You will need to bring sheets, pillows and bedding, also all kitchen equipment and utensils. If you do not intend to bring this with you, you can also purchase packs from Liberty via a 3rd party company. Yes you can, one guest can stay two nights per week. You will need to liaise with management beforehand, and sign them in and out every time the leave. Depending on the availability of rooms before your arrival date, you may be able to arrive early. Unfortunately it is not possible to swap rooms in hall, if you have issues with the room you have been allocated please contact the hall management. It is possible to extend your stay, but you will have to pay the applicable summer rate for 2017 this £209. If you would like to extend your stay please contact the hall management. Under special circumstances it can be arranged, it costs £30 per bathroom, £100 per kitchen including oven. The laundry costs £2.30 per wash and £1.20 per dry.